Moogles are a species originating from the Final Fantasy series made by Square Enix. They have appeared in almost all Final Fantasy games and since became the series' mascot. The first appearance of a Moogle in the Mario franchise is in Mario Hoops 3-on-3, which was likewise developed by Square Enix. In this game, a Moogle appears as one of five playable characters from the Final Fantasy series, the others being Ninja, Black Mage, White Mage, and Cactuar. Moogle is unlocked by earning a silver trophy in the Star Tourney on the Normal difficulty. 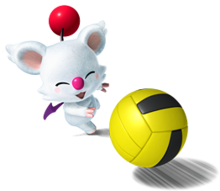 Moogle, along with the other Final Fantasy characters returned in the game Mario Sports Mix, where it is classified as a Tricky character (like in Mario Hoops 3-on-3). It is unlocked by beating the Mushroom Cup Tournament of any sport. Moogle's power in this game is very weak, and its speed is below average, but it makes up for those weaknesses with a high technique stat. However, unlike most characters with high technique attributes, Moogle's full power throws do not have a curve added to them. Moogle's artwork for Mario Hoops 3-on-3. Moogle's mugshot in Mario Hoops 3-on-3. Moogle's character select sprite from Mario Hoops 3-on-3. Mario Sports Mix group art with Cactuar. Mario Sports Mix CSS icon. French Mog The name of a specific Moogle that debuted in Final Fantasy VI. This page was last edited on April 14, 2019, at 21:22.